Apparently I’m on a truffle kick. I tried out these lil’ guys this morning because they were fast and I had all the ingredients on hand. They are yet another spin on a Practical Paleo recipe. Diane’s book had made some great recipes really easy and accessible. I am genuinely grateful for this book. 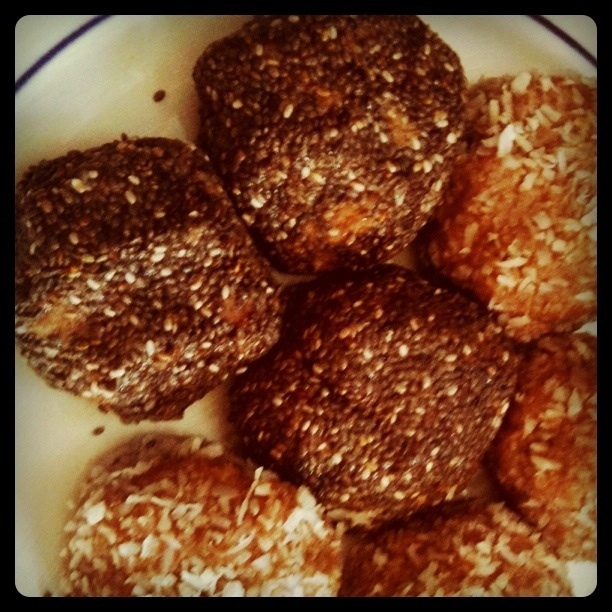 Tahini truffles really remind me of halva (see here and here). These are almost like my Raw chocolate Halva actually. I used a pre-made (home made) chocolate coconut butter and I used honey (Diane’s recipe used regular coconut butter and some maple syrup). Both of these things contributed to the Halva-like taste. If you want a quick, sweet treat… mix these up pronto! In a bowl, mix together all ingredients except for the rolling stuff. Form “dough” into tablespoon sized balls and roll in seeds or coconut. Chill until firm and EAT! This is a great idea! Love the simplicity and elegance of the recipe. I usually make my truffles with Artisana Coconut Butter, but I have a feeling that Tahini will pack some wonderful umami into this dessert. Where do you buy you shredded coconut? Shredded coconut (unsweetened) can be found at most health food stores. Sometimes stores like ralphs or vons will have some in their “natural” food section. You can also order online from amazon, tropical traditions, or Bob’s Red Mill. Flakes or Shreds will work.